Over at my home-for-work, I write a bit about Week 16. The period between Christmas and New Year is quiet, as expected, so these combined weeknotes are very brief. Still, a few things to note. Boxing Day saw the broadcast of my Four Thought talk, The Coded World. It’s still available for download from the Four Thought site. There was a really positive reception to it, from what I’ve seen and heard, so I’m very grateful for that. I returned to the office on the 2nd. Since then, I’ve filed a proposal for an interesting, short project; chased a few other projects and organised some meetings; and spent some time hacking on a short project of my own. That project has mainly been an exercise in code and deployment, to keep my fingers fresh, and gave me a chance to explore Sidekiq – an asynchronous queue for Ruby built on top of Redis. There’s some loose ends to tidy, and I’ll mention it here when it’s a bit more robust. I’m also looking forward to reviewing its code with a friend – always easier to refactor with a fresh pair of eyes. And, of course, I wrote my Yearnotes. And that was Week 12. Week 14 holds some meetings, possibly a presentation, and more hacking. I’m also still looking for projects in early 2012, so get in touch if that sounds relevant. A week of ups and downs. Brighstone, which seemed a likelihood last year, isn’t going to be beginning in January, which is a shame, and led to me looking for new ways to fill the calendar. Fortunately, there were a succession of meetings this week about future work, with some things to consider. All very different types of work – one physical computing project for the arts, one about integrated, kiosk-like platforms, and one web-based content project. Nice to be exploring this diversity in my work, and I’m hoping some of these might go further. 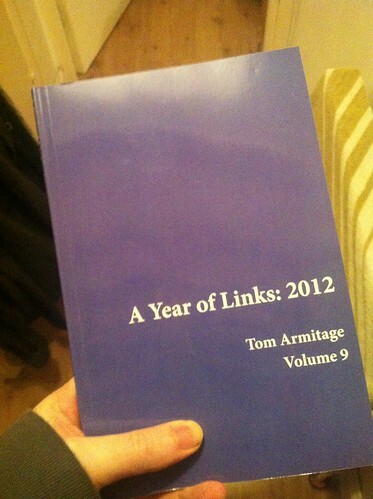 On Monday, this year’s Year of Links arrived. Very satisfying that, bar the install dance of being on a new computer, the code just worked, and a week later, I had a paperback of the previous year on Pinboard. Really satisfying. On Tuesday I went down to Stratford-Upon-Avon to present Spirits… to a selection of the team there. It was a straightforward presentation, but it was great to be able to wrap the project by showing them the final output, and the discussions we had around it were excellent – and went towards some interesting potential futures. Finally, I had a few meetings with the Caper team about Detling, lining things up for our March kick-off – always useful to be lining up planets and ducks, prior to project kick-off. (And: as Matt’s suggested, I’m going to start publishing these at the beginning of the next week. I wrote them in a spare moment at the weekend, but it’s much better reflecting on the week not on a Friday evening). And that’s the end of 2012. A very quiet end to the year: a few little meetings to wrap up one short project and investigate another. Otherwise, I treated it as roughly a half-week, and focused a bit on some personal work, none of which is really near completion. On Monday, I also built the visualiser for this year’s Radio Roundabout. They wanted something “a bit New Aesthetic” for this year. 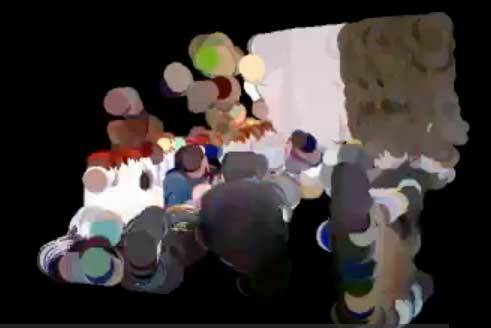 I loosely interpreted this brief to produce a Kinect-powered visualisation of the studio. It’s very straightforward: it takes the IR point cloud in 3D, colours it according to what the video camera can see – and then applies a strokeweight to each point based upon the audio line-in level (RMS). So what you get is a room full of blobs that pulse along with audio – particularly fine on the Dan Deacon or Todd Terje that played on the show, but fun with spoken-word too. The whole project – all two hours of gluing other people’s code together – is on Github. And that was it, really – a few leads on work I’ve followed up, but a quiet end to the year. Weeknotes are now on hold until 2013 – after the Radio 4 talk – and I’m hoping there’ll be a bit more news to share then. Not a bad start to freelancing, then; here’s to 2013. Week 9 seems to be the last work of client work this year. Monday was mainly about meetings, hopefully lining up some work for early next year. In the rest of the week, I spent a couple of days working on interaction design for an iOS product, drawing out maps, wireframes, notes on aesthetics and animatics. It turns out the Four Thought I recorded will be broadcast on Friday, 26 December at 8:45pm. Flattering to be in the Christmas week, even if it’s a time when most people might be busier with family! It’ll be on iPlayer as well; I’ll probably mention that in its own blogpost nearer the time. Otherwise, the usual admin – and beginning to plan Week 10, which is likely going to be a form of “project week” – prodding a few one-to-two day personal projects into life, if only to keep my hand in and get me up each day. And, today, it was exciting to share that my work with PAN is shortlisted in the Playable City competition – that might go somewhere exciting next year; even if it doesn’t, it’s great to be shortlisted given the quality of the other entries. And that was Week 9. No weeknote for Week 7; I was on holiday. I came back straight into the thrust of Week 8, though: two pitches, a talk, and a bunch of meetings. Wednesday itself was taken up with finishing writing, and then delivering, a talk for Radio 4’s Four Thought. This went very well in the end – and it should be on air around Christmas time. I’ll link to it when it’s available on iPlayer, of course. Pitches went out on Wednesday and Thursday, one in conjunction with PAN, for the Playable City brief, and one with Caper; with any luck, I’ll be writing about them more in due course. And then a Friday of meetings and post-holiday admin. Hitting the ground running, then, and with any luck, lining up a little more work before breaking for the holidays. So, from a week off, straight in to a somewhat full-on week with typing. But: good things emerging, that I’ll write about more in due course. Week 6 began with a couple of days helping Alex with a workshop. I also a spent a day with the fine folk of Pan exploring some pitch work – and it was lovely to just be in a space, working through ideas with them; they’re all good folk. Squeezed into Wendesday was a day of writing: working up a draft for the Four Thought talk in just under two weeks. Thursday saw the launch of Spirits Melted Into Air, a piece of work for the RSC that I’ve mentioned in passing (but not detail) in weeknotes a few times. It’s now live and in the world, and I’m really pleased with how it’s turned out; it’s nice to finally be able to show people a piece of work. And now it’s Friday. I’m writing this from the back of economy on the way to the US, for a last-minute, spur-of-the-moment holiday – I’ll be in New York for the next week, taking some time to take stock, settle my head, and see the sights (and friends). Do say hello if you’d like to. I’m also going to take the time to perhaps write a little, and think about trajectories. But mainly, I’m going to eat, read, and have a bit of a holiday and an adventure. A few different directions to focus on this week. Monday and Tuesday saw me wrapping up a piece of work with Storythings, having finished up a few nice pieces of code – though the documentation that accompanied it turned out to be as important for demonstrating the work to the client. The rest of the week focused on business development and quite a lot of admin – quite quiet, as a result, but some interesting meetings to potentially build on, perhaps in some new directions. The RSC work will launch next week – quite excited to finally take the wraps off it. It was great to see Natalia’s piece in the same series of commissions go live. Also, the announcement of my Four Thought talk on Thursday – which means next week will involve trying to hammer out a draft before I take a brief holiday. Looking back: this was very much an echo of the week before, really. But good to be plugging on, building things up, and exploring what might be coming soon. Onward.